WHAT IS IT? Twin Air has introduced an all-new air filter design for the 2018 Yamaha YZ450F. It is a twin-layer, reticulated, polyester foam filter that comes with one uniquely trick part to improve performance. WHAT’S IT COST? $30.95 (dry air filter), $33.95 (pre-oiled air filter). CONTACT? www.twinair.com or (800) 749-2890. WHAT STANDS OUT? Here’s a list of things that stand out with the Twin Air 2018 YZ450F air filter. (1) Toaster foam. The MXA wrecking crew isn’t fond of toaster air filters. What is a toaster air filter? It is a flat piece of foam that resembles a piece of toast. 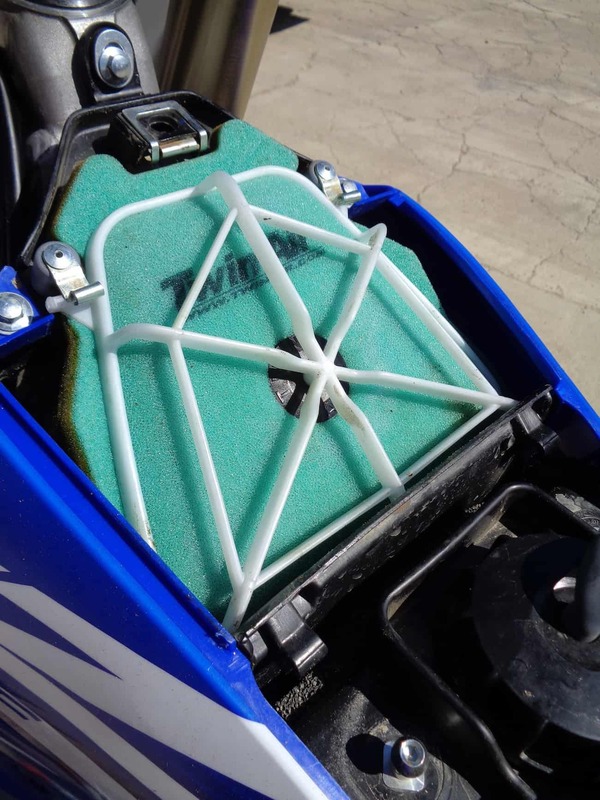 The YZ450F airbox, because of its location, doesn’t have room for a traditional dome-shaped foam filter and cage. 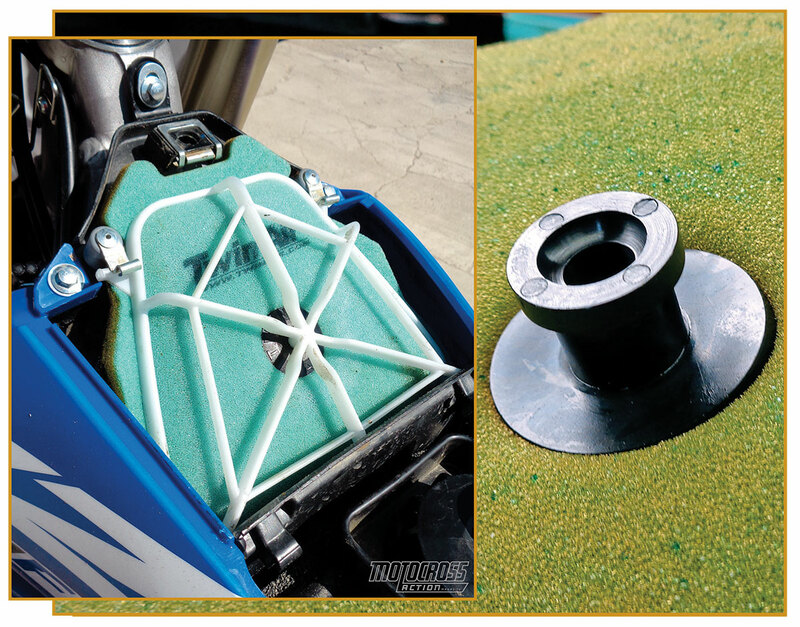 Thus, Yamaha uses a 15mm-thick flat foam air filter that is held in place by an external cage. This isn’t the optimum air filter layout for maximum airflow or dirt resistance. (2) Twin Air trick. MXA test riders noticed that because of the flat filter, the center of the stock YZ450F air filter seemed to be drier than the surrounding edges. It looked whiter than the filter foam that wasn’t in the center of the intake tract. This was caused by intake suction pulling the toaster foam down onto the backfire screen. The constant and repetitive rattling of the air filter against the backfire screen, sucked the oil out of the foam in the high pressure zone and, over time, allowed dirt to make its way through the un-oiled center of the piece of toast. Twin Air solved the problem , originally for the Yamaha Grand Pri team, by using a 22mm-thick filter and putting a large grommet and plastic top-hat spacer in the center of its YZ450F filter. The grommet not only supported the center of the filter, but the top hat lifted the air filter 11mm above the wire backfire screen to improve airflow (and, most importantly, stop the air filter from beating itself against the backfire screen 9000 times a minute). (3) Durability. The YZ450F’s external plastic cage secures the air filter with a needle-shaped plastic locating pin. On the stock air filter, the locating pin goes through the foam. We noticed degradation of the foam around the pin. Thankfully, Twin Air’s central grommet not only eliminated the tearing of the foam at the pin, but supported the filter better. Keep a close eye on the two metal spring clips at the top corners of the air filter. They are designed to swivel to hold the plastic cage in place. Over time, these clips could break off. MXA RATING: If you own a 2018 Yamaha YZ450F, you should consider upgrading the stock piece of toast for one that breathes better, has thicker foam and is more durable.